Eastport Nesting Pram 7' 9" 75 lbs. 48 in. 375 lbs. OPEN 5" 25" 42 sq ft. Item Ships FREE with Base Kit! "Dinghy" is derived from an old Hindi word for a sailing or rowing passenger vessel. In English, a dinghy is a small rowing and sailing boat, often (but not necessarily) serving as a tender to a mother ship. At Chesapeake Light Craft, "dinghy" means "Eastport Pram" and her larger sister, the Passagemaker Dinghy. Both boats are champion tenders. They can carry a decent load, don't take up much space, and they were designed to be rowed and towed. They sail, too. The Eastport Pram is 7'9", which is pretty small, but still not compact enough for storing aboard the smaller classes of cruising yachts. If you need something with a tiny footprint, one choice is an inflatable. Dinghy snobs like us refer to them as "deflatables." They are heavy, expensive, prone to failure, and can't be rowed or sailed---so you're committed to carrying around an outboard and its fuel along with the soulless rubber bladder of the inflatable. So that leaves a nesting dinghy, and here's a very fine example. The Eastport Nesting Pram shares its hull with the stock Eastport Pram. With some 800 of them built, it's probably one of the most popular dinghies in the world. The Eastport Nesting Pram has a demountable front half which nests completely in the back half. The "nested" package is a very manageable 4'9" x 4'0" rectangle. It can be stowed on the decks of cruising yachts down to pocket-cruiser size. Or, it can store in your apartment, your RV, your shed, or at the marina. At a casual pace, the Eastport Nesting Pram takes one minute and 20 seconds to assemble or disassemble. You'd need some sort of pyrotechnic device to inflate (or deflate) an inflatable dinghy that fast. We spent a lot of time refining the Eastport Nesting Pram. We were concerned that the only thing a lot of extant nesting dinghy designs do well is....nest. We have kept all of the fun and function of the stock Eastport Pram---including the sailing rig---with no compromises for its nesting function. The nesting version is still just as easy to build. Though the nesting components mean that the assembled Eastport Nesting Pram is slightly heavier, sailed and rowed against a standard Eastport Pram, it is just as fast. Here's how it works. If you don't need the sailing version, just order the "rowing kit." This gives you the complete boat, ready to row. The daggerboard trunk, for sailing, is INCLUDED in this version. Builders who will go sailing will order the "Rowing Kit" AND the "Sailing Component Kit." Adding the Sailing Component Kit gives you the mast, boom, yard, daggerboard, rudder, sail, mast step, and a center thwart that's integrated with the daggerboard trunk. The sailing kit includes a proper plug so that you don't ship water through the daggerboard trunk while rowing or towing. The Eastport Nesting Pram is built full-length using the LapStitch™ technique, and only cut in half later. (You have to build full-length so that you don't end up with a "kink" at the joint in the boat. The Nesting Pram is so "fair" that even quite close up it's hard to discern that it's a nesting dinghy.) At the joint are two very strong structural bulkheads. Six stainless steel bolts with large, easy-to-handle wing nuts fasten front and back together. The waterline is below the top of the bulkhead, so in theory it's impossible to ship water through the joint. A rubber gasket is included, however, which truly seals the joint and helps protect the finish on the two parts. All Eastport Prams have the holes for the temporary copper stitches drilled in the hull parts by our computerized machinery. Bulkhead locations are indicated by drill holes and machined "mortises" so there's no need for measuring, and the parts fit exactly every time. New for 2010 is an updated sailing rig. While the old rig is powerful and weatherly, the new rig is taller, bigger, and sports battens for a sleeker look and even more power on all points of sail. All this, and the Mark II mast is actually a foot shorter! This is the perfect sail training dinghy for kids OR adults. We gave the Eastport Pram deep rocker for low wetted surface and to keep the transoms from dragging. 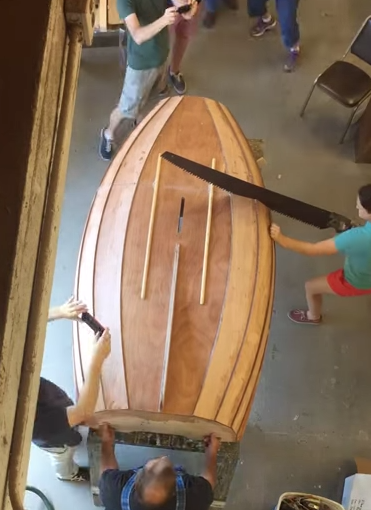 The result is a boat that is as easy and satisfying to row as you can expect on such a short waterline. Used as a tender to a larger boat, or kept at a dock, it's possible to undertake a long afternoon row around the local waters without breaking a sweat. Yes, an outboard or trolling motor may be fitted, up to a maximum of 2 horsepower. Small tenders should be able to withstand heavy handling alongside the mothership or in the dinghy park. Planking is 6mm okoume throughout, with three 9mm frames and seats. There’s a big, deep skeg for tracking under tow. In addition to multiple layers of fiberglass on the bottom panel, there are two cypress rubbing strips on the bottom to take the abrasion of dragging on a beach. For added safety, foam flotationis fitted beneath the seats. Plans, for those starting from scratch, comprise full-sized patterns for every part, plus a complete instruction manual specific to the Nesting Pram. You need an excellent rowing and sailing dinghy that packs in a small space. You need a dinghy with a maximum payload of 375 pounds. You want a perfect small sail trainer.